a red patch in the mouth with a velvet appearance, often a sign of oral cancer. A red, velvety, plaquelike lesion of mucous membrane that often represents malignant change. /eryth·ro·pla·kia/ (ĕ-rith″ro-pla´ke-ah) a slow-growing, erythematous, velvety red lesion with well-defined margins, occurring on a mucous membrane, most often in the oral cavity. Oral pathology An oral lesion characterized by a reddened patch with a velvety surface and epithelial changes ranging from mild dysplasia to CIS to frankly invasive CA DiffDx Candidiasis, TB, histoplasmosis, denture irritation. Cf Leukoplakia. A red, velvety plaquelike lesion of mucous membrane that often represents malignant change. n a flat red patch or lesion of unknown etiology on the oral or pharyngeal surfaces. Currently identified oral premalignant diseases include leukoplakia, erythroplakia, palatal lesions associated with reverse smoking, oral lichen planus, oral submucous fibrosis, actinic keratosis and discoid lupus erythematosus. RCTs investigating the effectiveness of chemopreventive agents for patients with premalignant lesions, leukoplakia or erythroplakia were included. Oral premalignant lesions (OPLs) such as leukoplakia, erythroplakia and lichen planus have been strongly associated with alcohol and tobacco use, increasing the risk of developing malignancy, although age, trauma and poor oral hygiene are pointed out as well (1-3). 1] Other OPMDs include leukoplakia, erythroplakia, erosive lichen planus, discoid lupus erythematosus, and palatal lesions due to reverse smoking. The conditions considered as pre-malignant are leukoplakia, lichen planus, oral submucous fibrosis and erythroplakia. 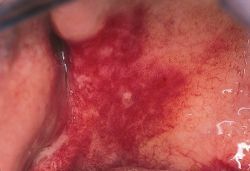 Image 2 depicted an early, less pronounced lesion, erythroplakia, and resulted in only 40% of the respondents correctly identifying it as suspicious for cancer. 3) Additionally, all cases of erythroplakia present with some degree of epithelial dysplasia. Leukoplakia, erythroplakia, and erythroleukoplakia are the most common oral lesions. Leukoplakia, erythroplakia and submucous fibrosis are recognized oral precancerous lesions, and may exhibit the histopathological features of epithelial dysplasia, ranging from mild to severe. Etiology of erythroplakia is unknown but assumed to be similar to invasive squamous cell carcinoma etiologies. They are leukoplakia, erythroplakia, hyperplasia and dysplasia ultimate precursor lesions. The oral cavity also can host precancerous conditions such as leukoplakia and erythroplakia, which appear as thickened white areas on the mucosa.